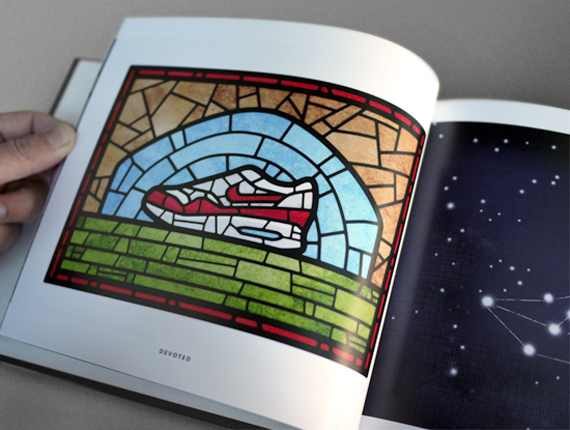 A high end art book containing 100 personally designed and illustrated interpretations of the greatest sneaker of all time. 424 backers pledged $40,369 to help bring this project to life. 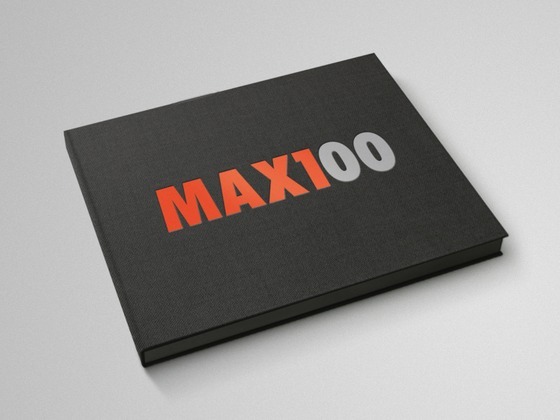 The goal of this project is to do a limited first edition run of the MAX100 book. I want to get the book produced at the best possible quality and get it in your hands. By pledging at the $50 level and above, you are reserving and purchasing your copy of this first edition. 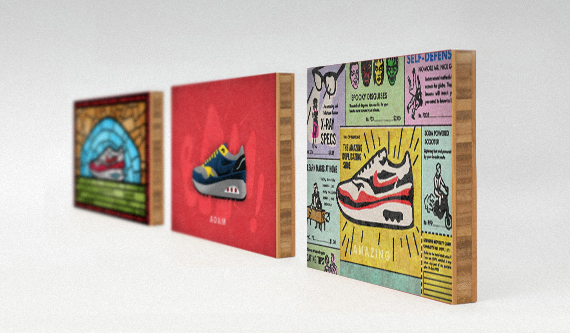 The book is made up of 100 of my personal interpretations of the greatest sneaker ever made, the AirMax1 (60 entries that exist and 40 that I'm currently creating). Between the 40 new entries and the behind the scenes content, the book will be almost half entirely new, never before seen content. UPDATE: Please note international shipping charge chart in first FAQ at bottom of the page. If you are pledging from outside the US, please add that amount to your pledge to cover shipping. I've created a family of rewards that feed directly off all the shoes in the book. For upper level donors, I will be producing a shoe that is completely made up of donor names above the $100 level. SPECIAL EDITION IN SLIPCASE // From the $75 level and up, your book is signed and comes in a custom produced slipcase. SPEAKING ENGAGEMENT // A $2,000 pledge. (the screens above are from my formal presentation). I will come out to your group, class or organization and speak about this project, my 15+ career in design and the value of doing personal work. Please see FAQs below for more details. The money will be spent producing the book and the rewards including all production costs, fulfillment and shipping (international shipping extra, see FAQs at bottom of page). I have partnered with fantastic art book printer, Oddi printing out of Iceland, for production of the book. I have poured so much of my time and passion into this project that I wanted to present them in the best possible way, and finish it right. How does a project like this get started? Well, if I'm honest, the whole thing kind of started by accident. As a long time designer, I was looking for a personal project that would give me a chance to get back into illustration. I've been a sneakerhead as long as I can remember, so I decided to illustrate every pair of shoes I ever owned. I began creating this personal museum of a youthful obsession that I never outgrew. After finishing that, I took my favorite shoe of the bunch, the AirMax1, and I began illustrating it in a different way each day. My plan was to do it for two weeks, but about the middle of the second week, things took a turn. I started exploring the styles of some of my design heroes and current designers and illustrators that inspire me most. I loved digging into their work, trying to figure out what made it tick, and then apply it to this one object. By then the project took on a life of it's own. I left the tributes behind and began to explore, illustration, photography, design and most importantly, ideas. How many ways could I think of to interpret this one object? It became a playground for all my influences and ideas. When I realized I was going to keep doing this for a while, I set for myself a goal of 100 total. I kept working at it until I reached around 60 shoes over the course of several months, but the demands of work and family dictated that I move on to other things. I was and still am overwhelmed with people's response to the series, and I've always had this nagging feeling that I have unfinished business. 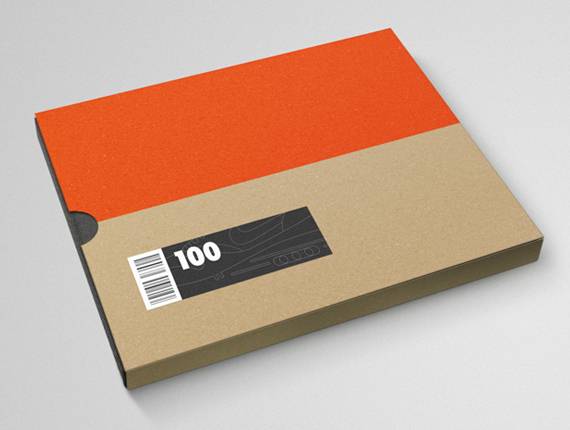 That was the birth of the MAX100 book project. The project duration is set at 60 days, so that I have time to complete all of the remaining entries and finish the design and layout of the book. While you guys are supporting the project, I'll be creating what I hope are the best ones yet and going back and refining some of the existing ones to make them even better. I appreciate you taking the time to consider joining me on this. You can follow my journey through project updates and for more, follow me on Twitter here. I'd love your support, and I'll see you at the finish line. Thanks. You will get access to project updates and receive my eternal gratitude for helping make this book happen. 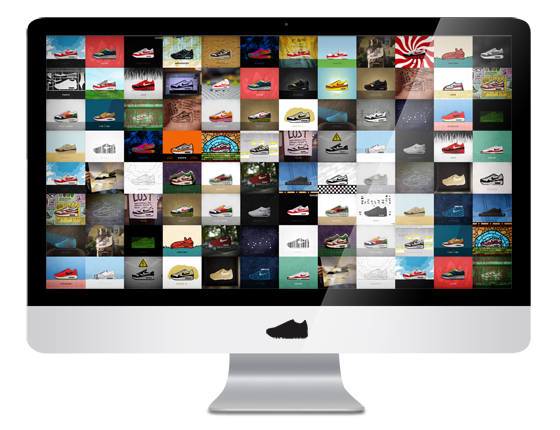 UPDATES / DIGI-PACK / You will have access to project updates as well as a high quality pdf of the shoe illustrations ( viewable on iPad/iPhone & other digital devices ) and a computer wallpaper set. See project FAQ's at bottom of page for full details. 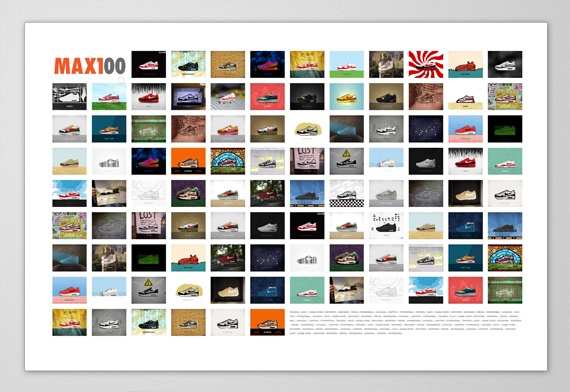 UPDATES / DIGI-PACK / POSTER / Access to project updates, Digi-Pack and a 24" x 18" MAX100 poster, showing all 100 shoes in the series on a single sheet. Full color printing quality stock. 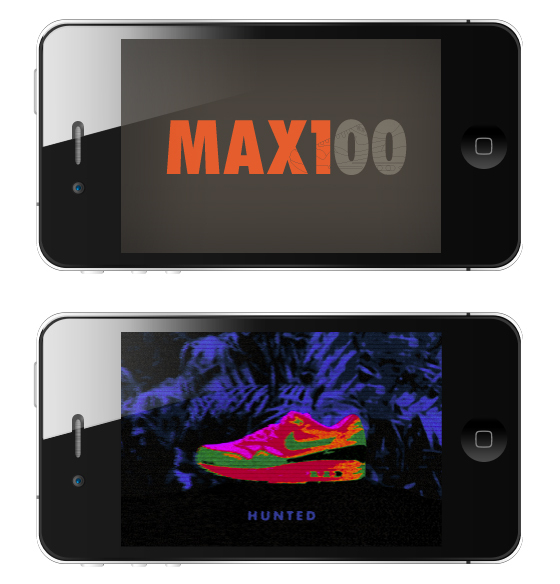 UPDATES / DIGI-PACK / POSTER / BOOK / Access to project updates, Digi-Pack, poster and 1 copy of MAX100. UPDATES / DIGI-PACK / POSTER / BOOK (SIGNED) / SLIPCASE / Access to project updates, Digi-Pack, poster and 1 copy of MAX100 (signed) in the special slipcase. UPDATES / DIGI-PACK / POSTER / BOOK (SIGNED) / SLIPCASE / NAME IN BOOK / Access to project updates, Digi-Pack, poster and 1 copy of MAX100 (signed) in the special slipcase. In addition, your name will be integrated into a special donor illustration, containing all donors at and above this level. UPDATES / DIGI-PACK / POSTER / BOOK (SIGNED) / SLIPCASE / NAME IN BOOK / ART PRINT / Access to project updates, Digi-Pack, poster and 1 copy of MAX100 (signed) in the special slipcase. Your name will be integrated into a special donor illustration, containing all donors at this level. (1) 10x8 inch Plywerk mounted print of any shoe of your choice. UPDATES / DIGI-PACK / POSTER / BOOK (SIGNED) / SLIPCASE / NAME IN BOOK / ART PRINTS (3) / project updates, Digi-Pack, poster and 1 copy of MAX100 (signed) in the special slipcase. Your name will be integrated into a special donor illustration, containing all donors at this level. (3) 10x8 inch Plywerk prints of any shoes of your choice. UPDATES / DIGI-PACK / POSTER / BOOK (SIGNED) / SLIPCASE / NAME IN BOOK / ART PRINTS (6) / project updates, Digi-Pack, poster and 1 copy of MAX100 (signed) in the special slipcase. Your name will be integrated into a special donor illustration, containing all donors at this level. (6) 10x8 inch Plywerk prints of any shoes of your choice.